Cadiz, Spain was the third port of call on the trans-Atlantic cruise we took in April 2009. 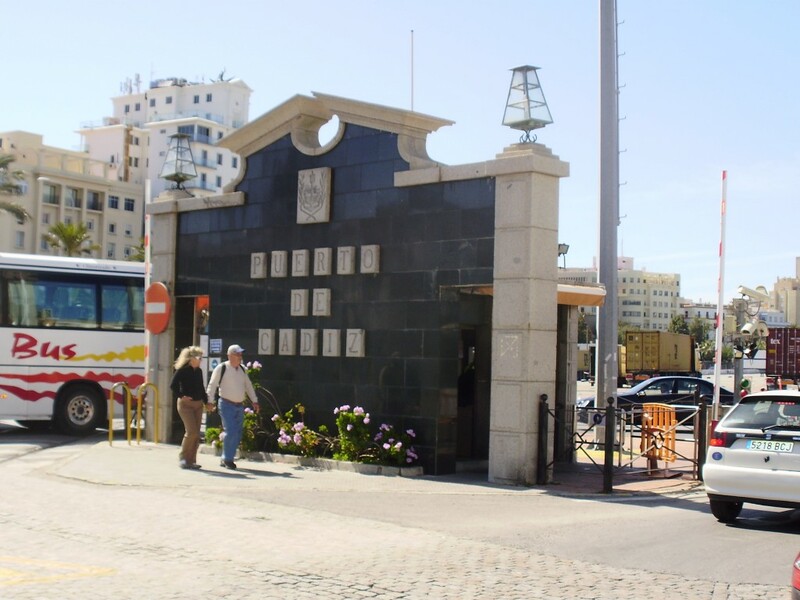 It lies along the coast of Spain on the Atlantic about 150 kilometres from Gibraltar (119 km via the inland route), not quite two thirds of the way from Portugal to Gibraltar. It lies on a narrow spit of land, a peninsula, jutting out from the mainland to enclose a large bay, though it looks more like an island connected by a causeway to the mainland. 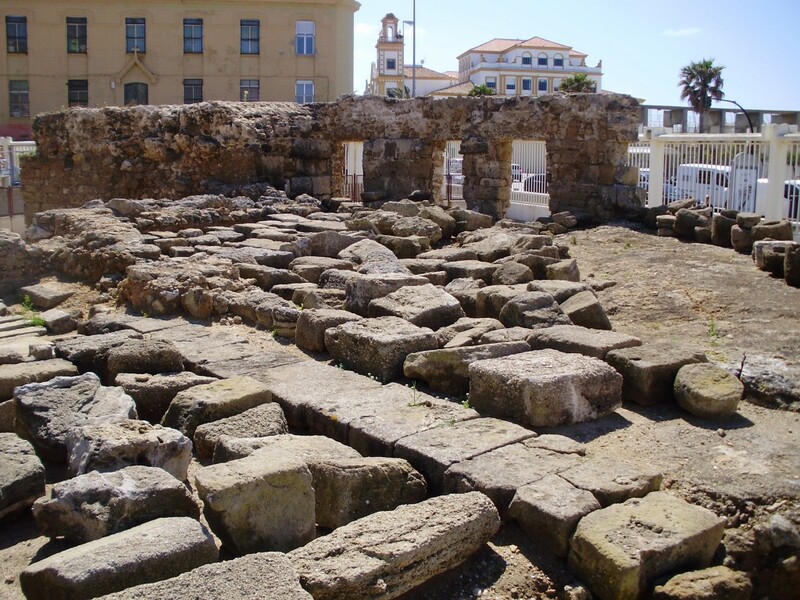 The city is the oldest continuously inhabited city in Spain and one of the oldest in Europe. 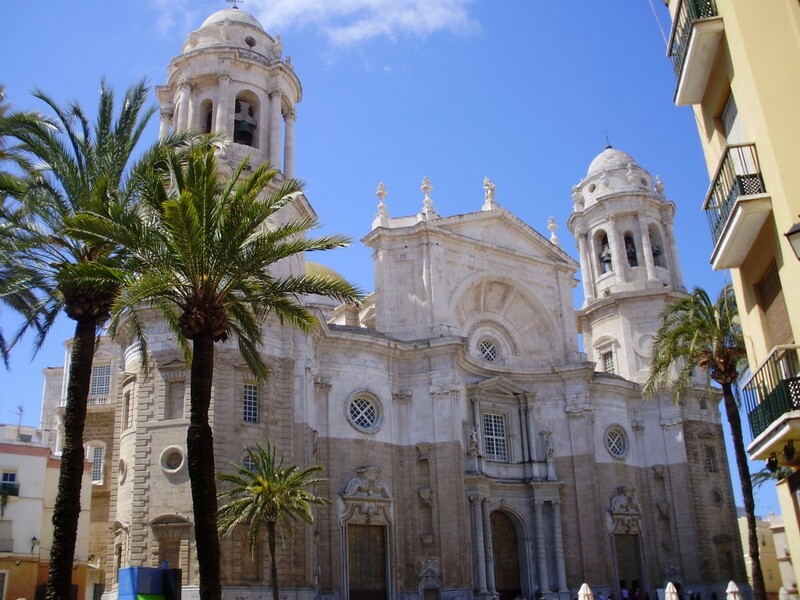 It is the capital of the province of Cadiz and is part of the autonomous region of Andalusia. The port is on the sheltered side of the peninsula on the North end. This is adjacent to the Old Town, the walled part of the city. This part has preserved much of its ancient heritage and differs significantly from the more modern city outside the walls with its narrow cobblestone streets and small shops. 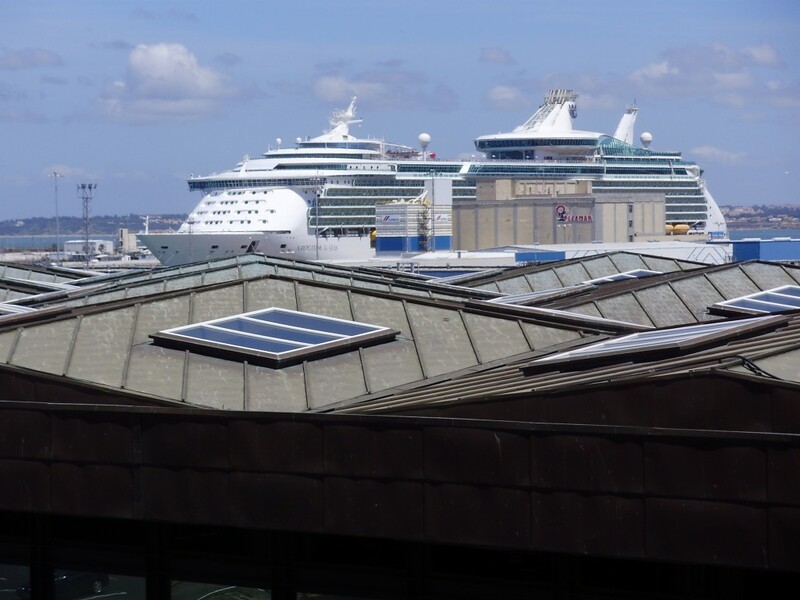 But even in the modern part of the city, all buildings are fairly small as Cadiz sits on a sandspit, making the sinking of the foundations necessary to support highrises prohibitively expensive. As with all ports of call, we had an option to take one of several excursions, including one to the inland city of Seville, but we opted to explore on our own. And we are glad we did. The Old Town is not very large and you can explore much of it during a stopover. 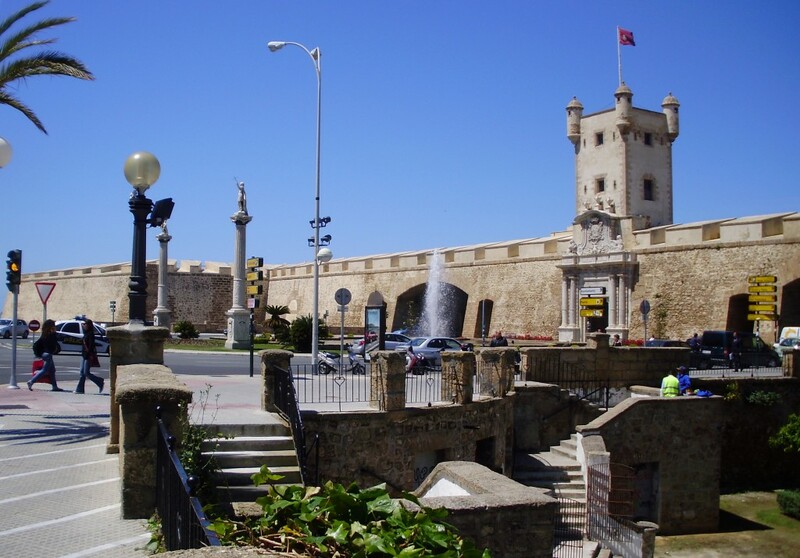 The Old Town of Cadiz is a walled city. 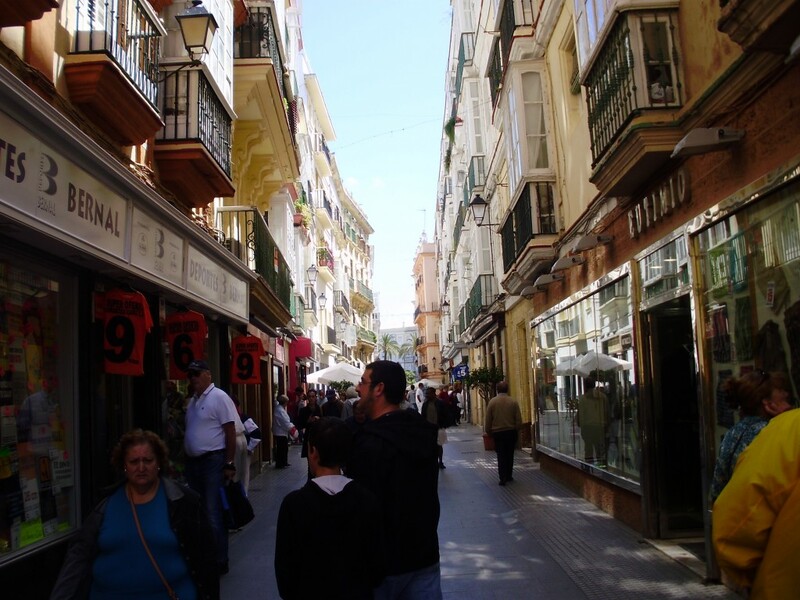 Beyond the wall is modern Cadiz with wide tree-lined streets and shopping plazas. All the beaches are in this area. This photo taken from the modern city side looking towards the Old Town. There are few vehicles in Old Town as the streets are narrow. We left the port and followed the road along the wall separating it from the newer part of the city to the side of the peninsula facing the open sea. The short walk across the peninsula to the ocean took us to a steep sea wall with walk along the top. Part of the sea wall was overgrown with shrubs and we spotted cardboard boxes and other bits of debris here and there. We were surprised to find that these were home to a couple of dozen feral cats. This fellow came along and fed the cats and replenished their water bowls. The modern part of Cadiz can be seen in the background beyond the fortress. As we watched the cats, they started running up the wall towards the ledge at the top. A man was approaching and calling to them. 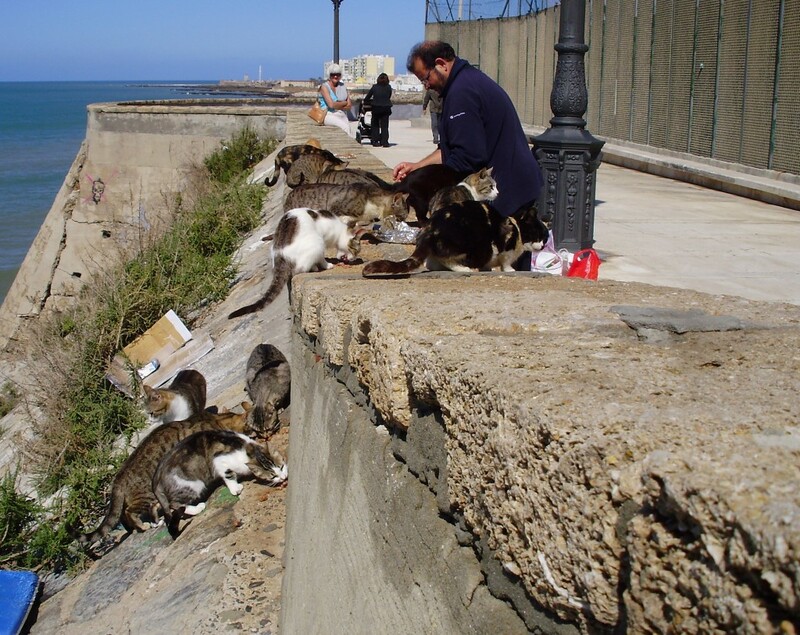 As they circled around him, he opened a couple of shopping bags and pulled out tins of cat food which he opened. He spread the cat food out in glops along the ledge and the cats had a feast. He also replenished their water bowls. This is one of the pleasures of exploring a port of call on your own. You sometimes run into the unexpected and so it was with the cats. After the man finished feeding them, he cleaned up and headed off and so did we. It wasn’t long before we came to a Roman theatre. This archaeological work was not discovered until 1980 when a warehouse fire destroyed the buildings sitting on top of it. 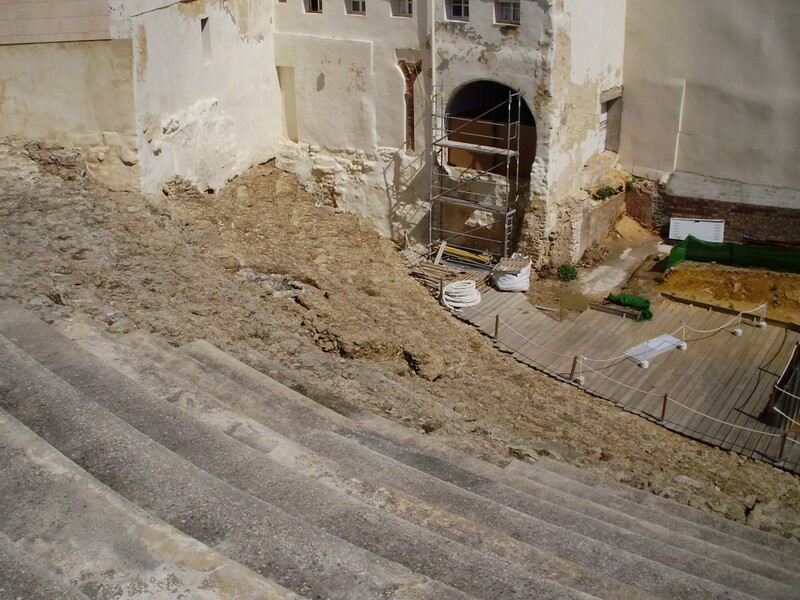 The theatre, the second largest Roman theatre in the world after the one in Pompeii, is still being restored to this day. Roman theatres are different than Roman amphitheatres. Roman theatres are semi-circles and much smaller than the amphitheatres which are full circles enclosing a large area where sporting events and games were held. The Coliseum in Rome is an amphitheatre. This Roman theatre is the second largest in the world after the one in Pompeii. It was not discovered until 1980. 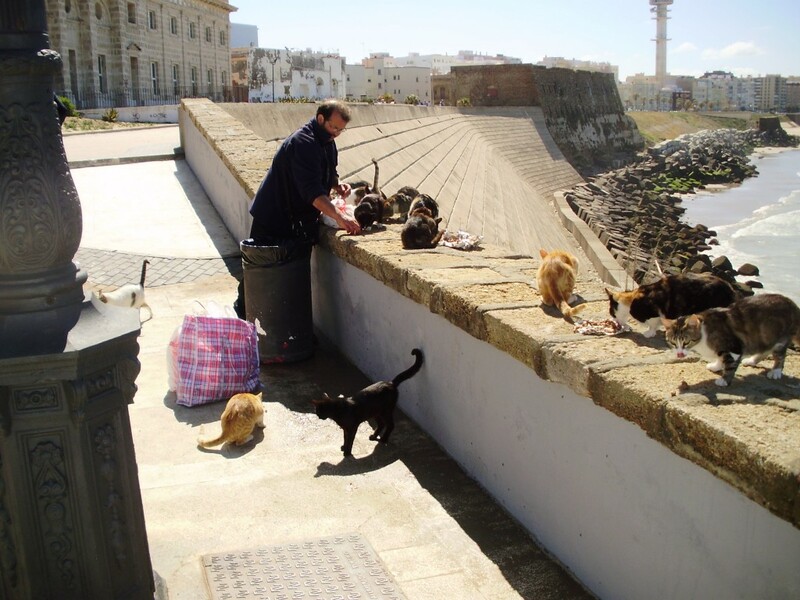 We asked Anna, the woman at the ticket booth, about the cats and she said they were much revered in Cadiz because they kept the rats out. People often feed them she said. After checking out the theatre we decided to check out the white tower we saw behind it. 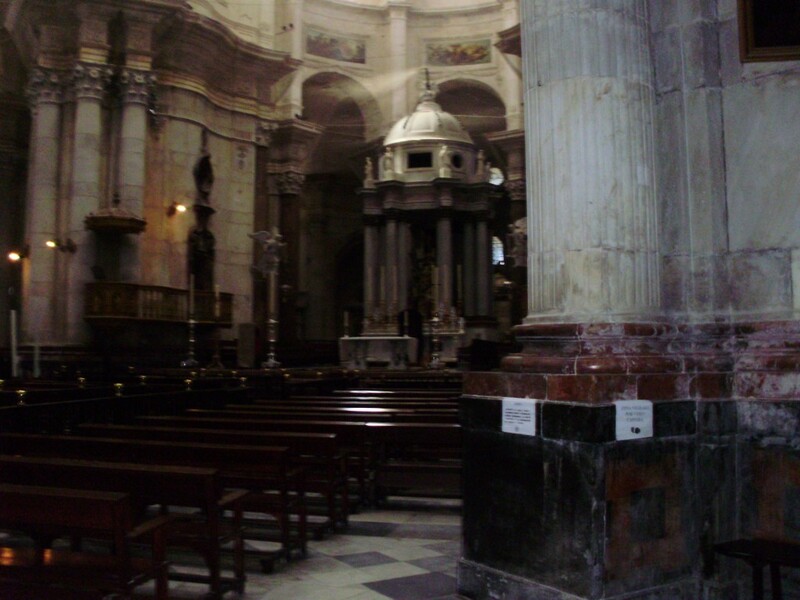 That turned out to be part of Cadiz Cathedral. 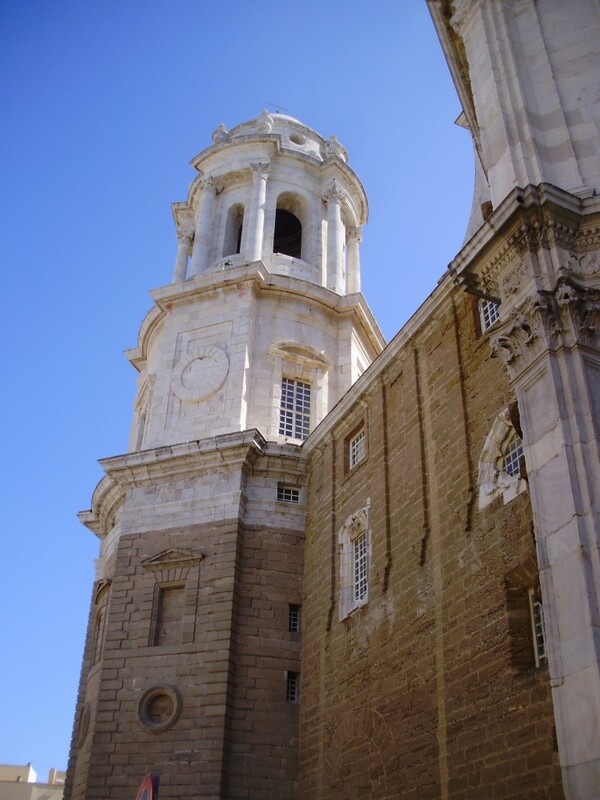 One of the two towers of the Cadiz Cathedral. Construction on the cathedral began in 1722 and continued for 116 years. It started out in the baroque style, but because it took so long to build, there are also rococo and neoclassical elements. The building was undergoing extensive restoration and repair work when we were there but still open to the public. 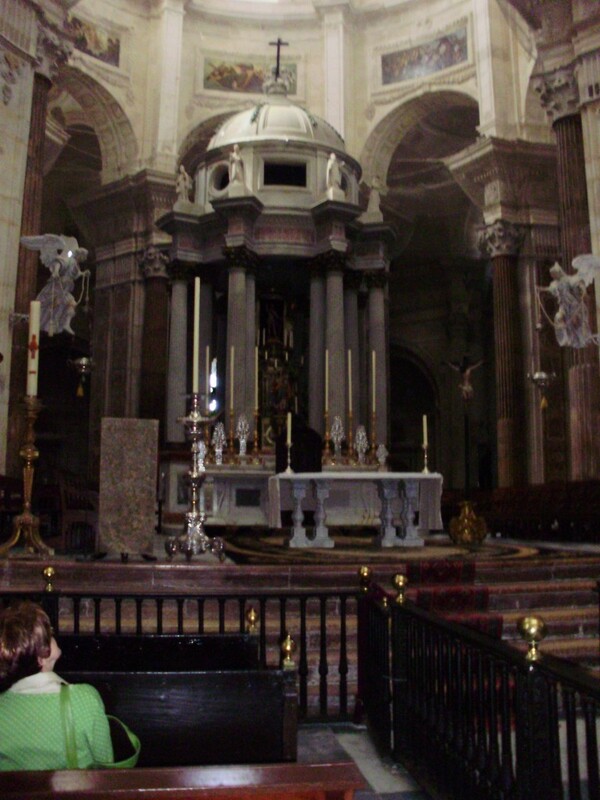 It is beautiful inside with the ornate woodwork and statuary you’ll find in most Roman Catholic cathedrals. 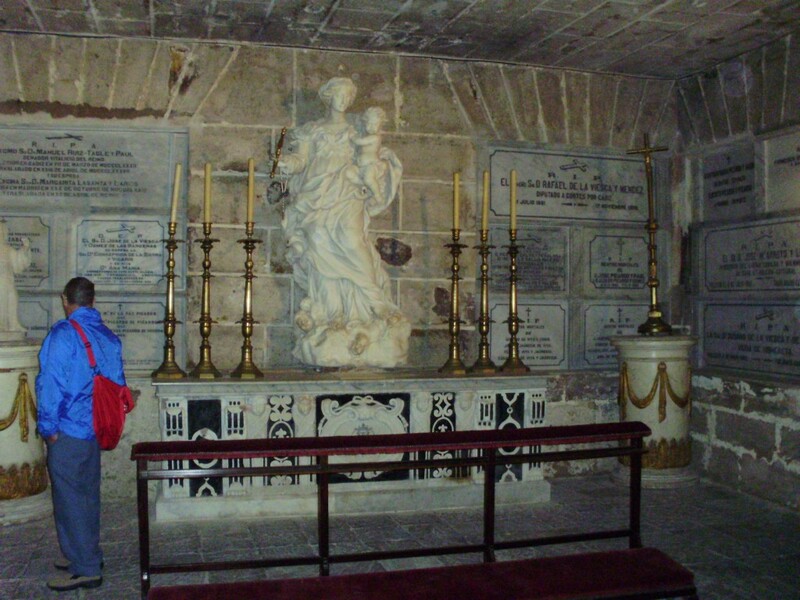 It also had a magnificent pipe organ and below the cathedral was a catacomb with numerous plaques and tombs. 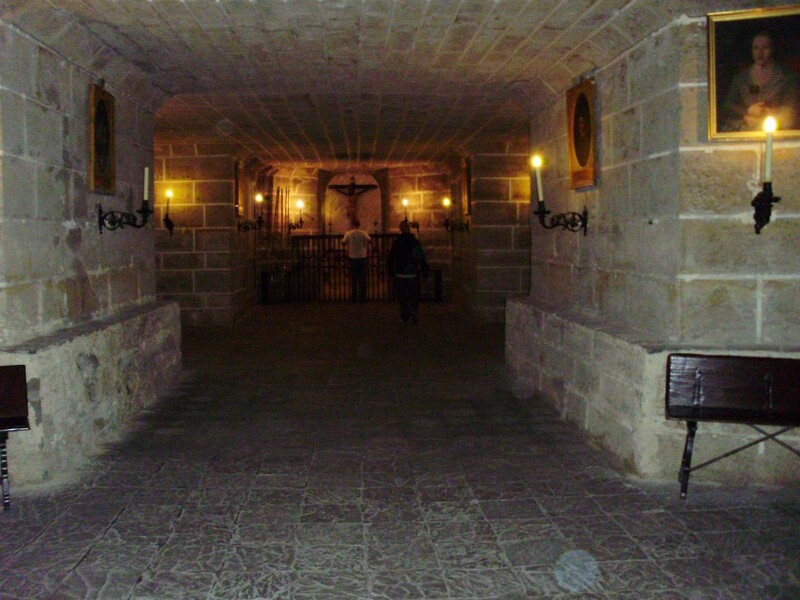 Some of the tombs in the catacomb below the cathedral. We wanted to pick up a few odds and sods before returning to the ship so we crossed through the gates in the huge stone wall surrounding the Old Town and made our way along some tree lined boulevards to a shopping mall. From there we walked back to the ship along the port road, passing by an extensive rail yard as we went. Spain has an excellent railroad system which we would use later when we travelled from Barcelona to Figueres. But that is a story for a later blog post! 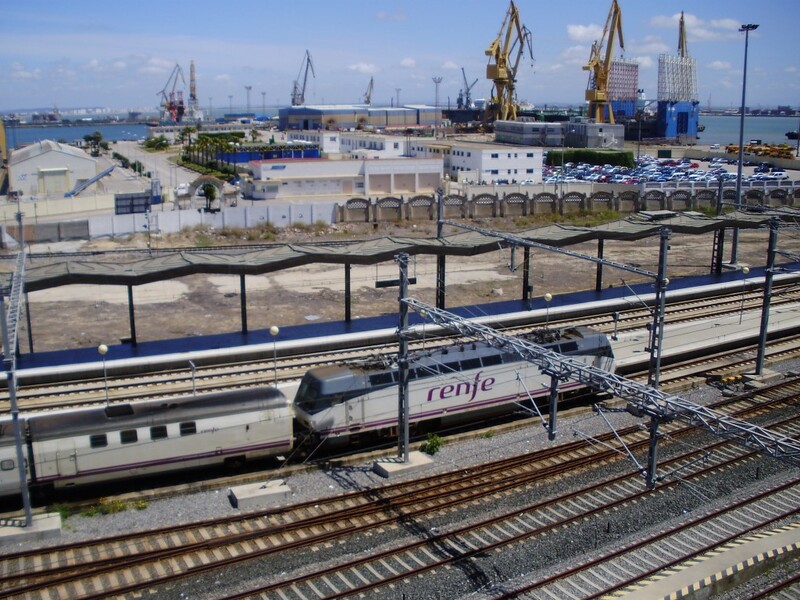 The rail yard of Cadiz, part of Spain’s efficient rail network. 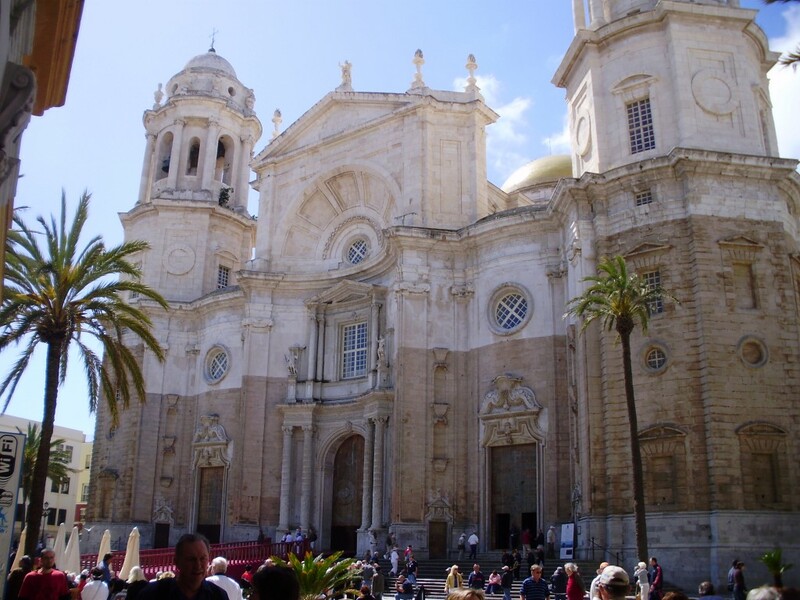 All in all, we enjoyed our visit to Cadiz, a charming little city by the sea. 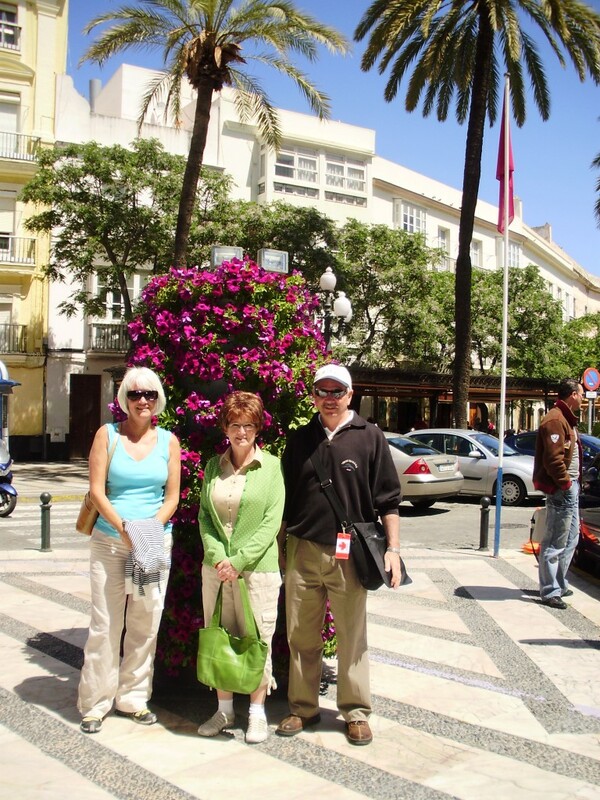 Here are some additional pictures of our visit to Cadiz in 2009. Hungry cats find a friend. 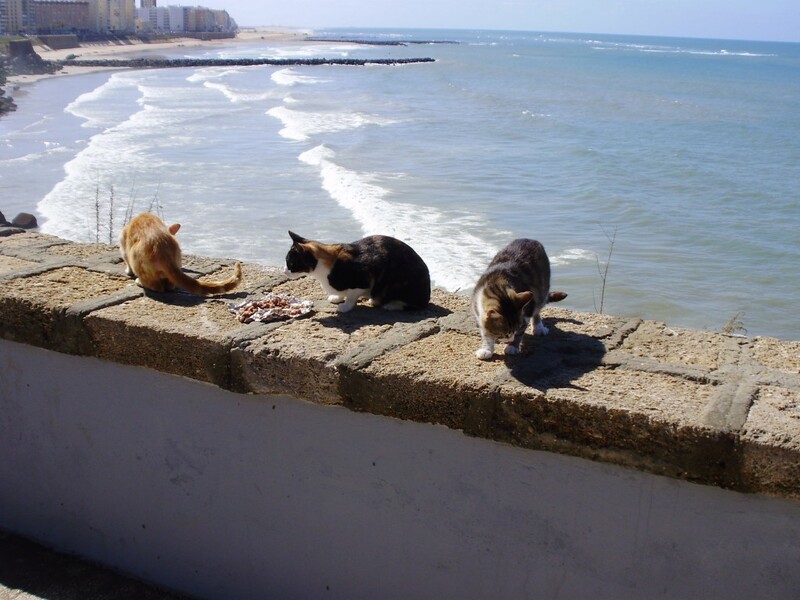 Cats feasting atop the sea wall. That’s the Atlantic Ocean in the background. 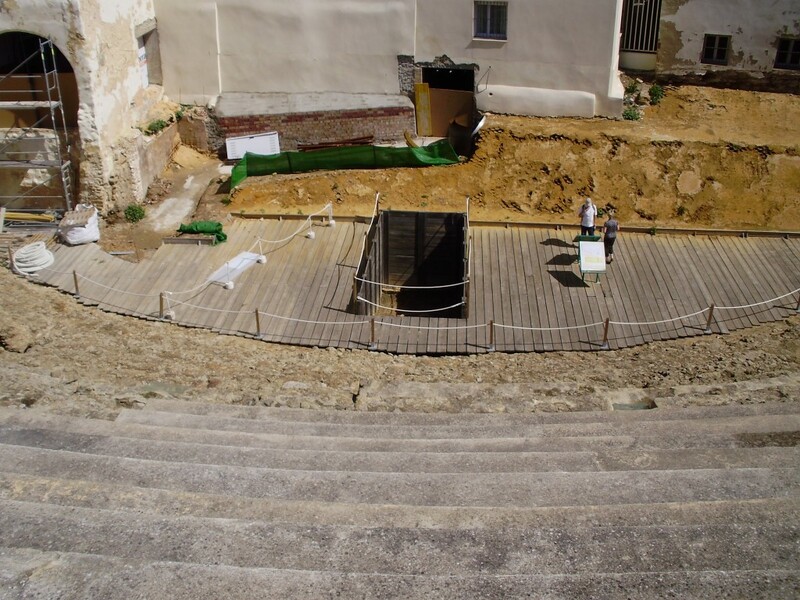 Excavation continues at the Roman theatre. 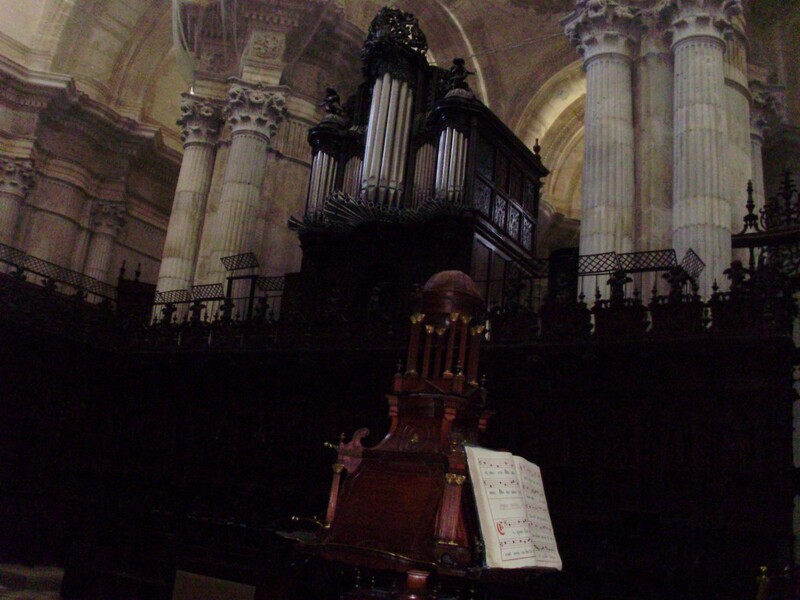 The pulpit inside the cathedral. 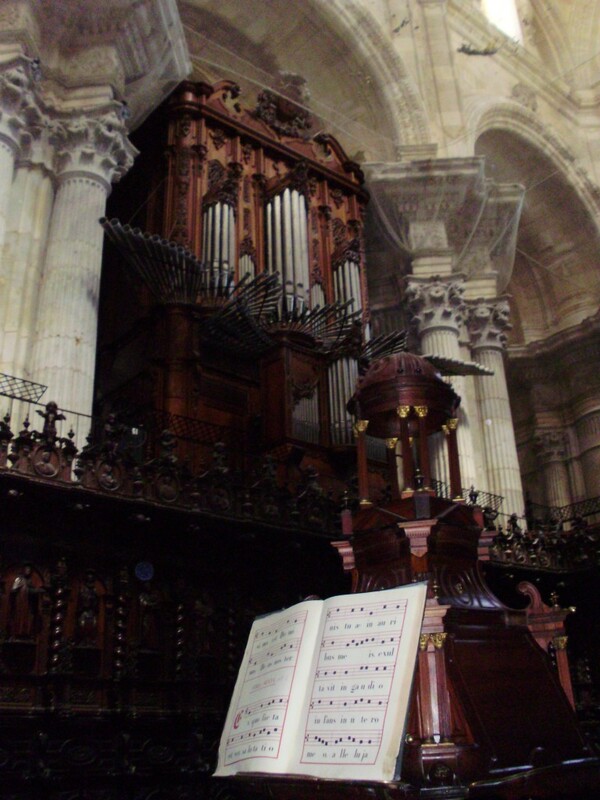 Inside the Cathedral of Cadiz. It is still an active church with regular services. 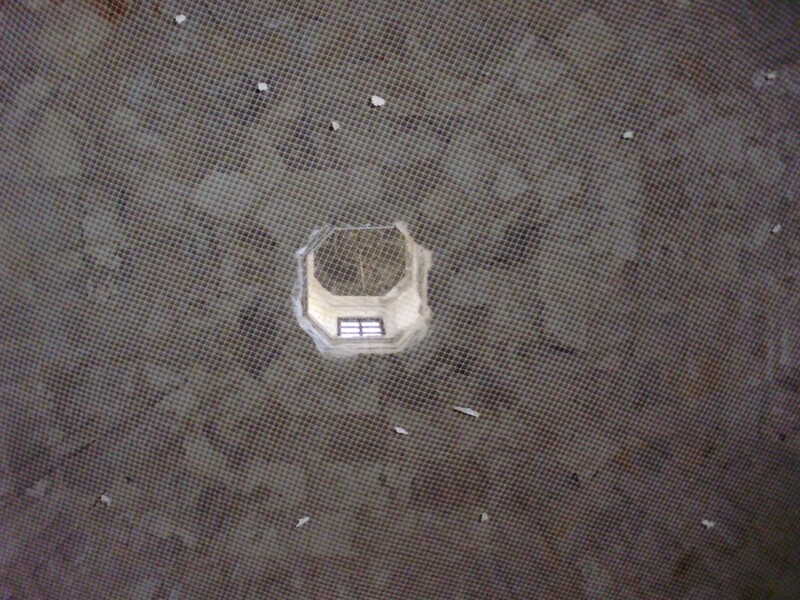 Steel mesh netting protects the people below from falling debris as the church was undergoing renovations. 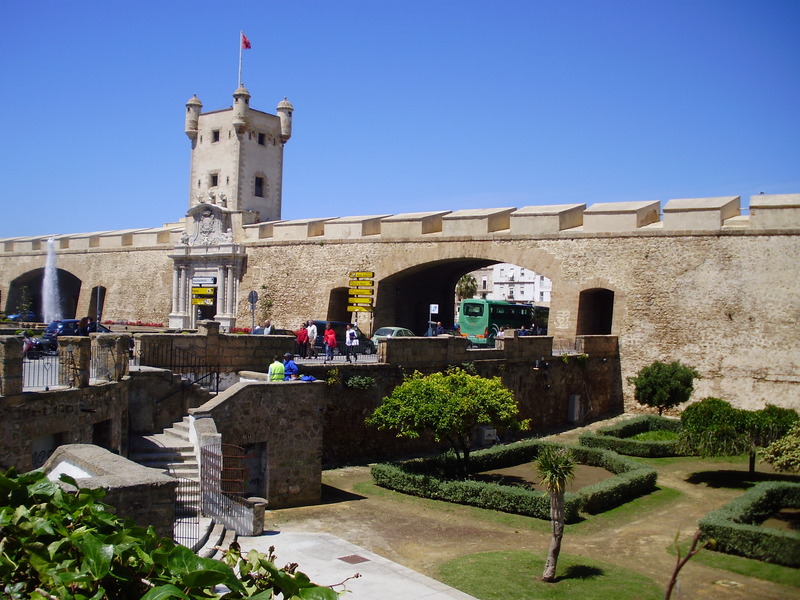 The fortress wall separating the Old Town from modern Cadiz. 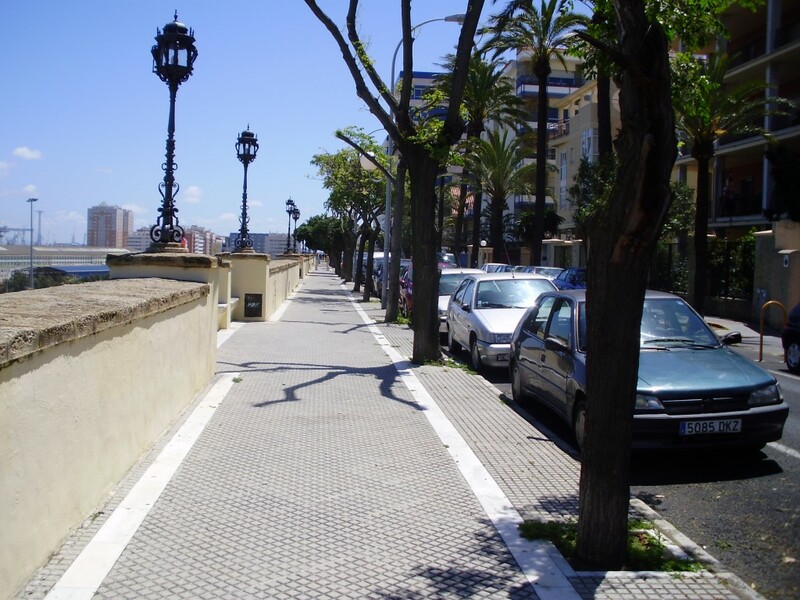 Tree lined street in the modern part of Cadiz. Janis and our friends Chris and Sheila in front of a gorgeous planter in Cadiz. Our cruise ship in the distance. Beyond is the mainland of Spain.